Foam Lightsaber Games For Star Wars Day (Or Any Day For That Matter)! Today is Star Wars Day, also known as May The Fourth. (May The Fourth as in May The Force Be With You.) Unlike last year, we don’t have any particularly geeky activities planned. It helped that May 4th landed on a Saturday last year. Mondays don’t lend themselves to elaborate celebrations. Still, we might battle using our foam lightsabers. Here’s how to make foam lightsabers. The parts only cost about $1 per saber and I can attest that they last. After a year of some serious use (we get really into our lightsaber battles), they are frayed but definitely still usable. Sure, foam might fly off when our sabers clash, but that just adds a bit more realism, right? The boys and I have come up with a few lightsaber related games. The first involves having two lightsabers per person. You do battle and any hit on a person results in them dropping a saber. Once they have all sabers down, a final strike kills them off. Last player standing wins. On Sunday, we came up with a variation. There’s still the two lightsabers per person and dropping as you get hit. However, we designated a spot as "out." When a player was killed, they retrieved their sabers, went to the out zone, and waiting for someone to tag them in (by touching sabers with them). Then they could return for battle. Since it was just my boys and me, our loyalties wavered. With a big enough group, though, you could have teams. The last team to have member(s) still "alive" wins. Another game we developed was lightsaber tag. For this, each player is armed with a lightsaber. One player is designated "it." Perhaps, they get a special color of saber to show people who is "it." The person who is "it" chases everyone else. "It" tries to tag the other players with his lightsaber. Instead of a simple tag-and-run, though, players can choose to stand and fight. Of course, you can’t kill the "out" player and neither can they be killed. But perhaps they can deflect blows that would have been tags and keep "it" at bay long enough until they can make their escape. Then, there’s bubble slashing. This is especially good for the younger players, but older players might enjoy it too. First, get an automatic bubble blowing machine. You can do this by blowing bubbles yourself, but the bubble machine can blow more bubbles on a more regular basis. Have the players slash as many bubbles as they can. You can call the bubbles incoming droid fighters or enemy blaster fire to give it a more Star Wars feel. There is no scoring here. Just the joy of destroying bubbles using foam lightsabers. 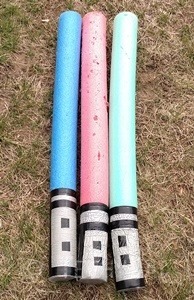 It’s amazing how much running around kids (and adults) can do with just some foam pool noodles and duct/electrical tape. With the summer approaching and parents "looking forward" to the kids being out of school all day, having an activity where you could either sit on the sidelines having the kids tire themselves out without you getting exhausted or jump into the fray is essential. If it’s a geeky, Star Wars related activity then that’s all the better!